Released in 1954 Rear Window is one of the very best films in the legendary career of Alfred Hitchcock. Even some of the greatest directors have at most perhaps 2 or maybe 3 films that people might cite as their best, but Alfred Hitchcock is one of those few that has several films you could pick from and each film valid points for why its the best could be made. Rear Window is one of the films many people cite as Hitchcock’s best film and I might just agree. I personally would slightly favor Psycho, but I could easily go with this one. Rear Window is a film I think every aspiring writer and director should sit down and view as its cleverly plotted with great characters and is prime example on how to tell a story and how to stage suspense filled scenes. Even though I might go with Psycho as my favorite Hitchcock film I think Rear Window has some of the best suspense scenes Hitchcock ever filmed in his career. 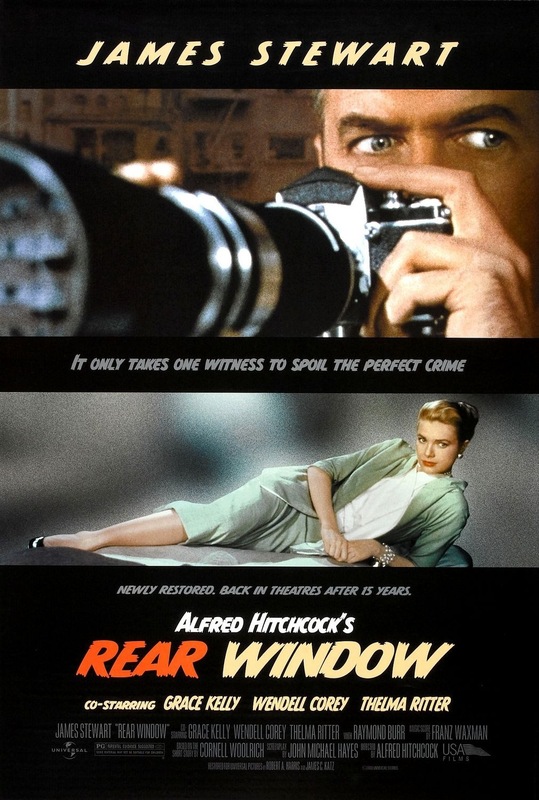 I hate to be a cliche and I’ve said this about other movies in other reviews, but Hollywood simply doesn’t make films like this anymore; Rear Window is at first very character driven as it takes a while before we get into the main plot and even it gets going characters are still the major focus. 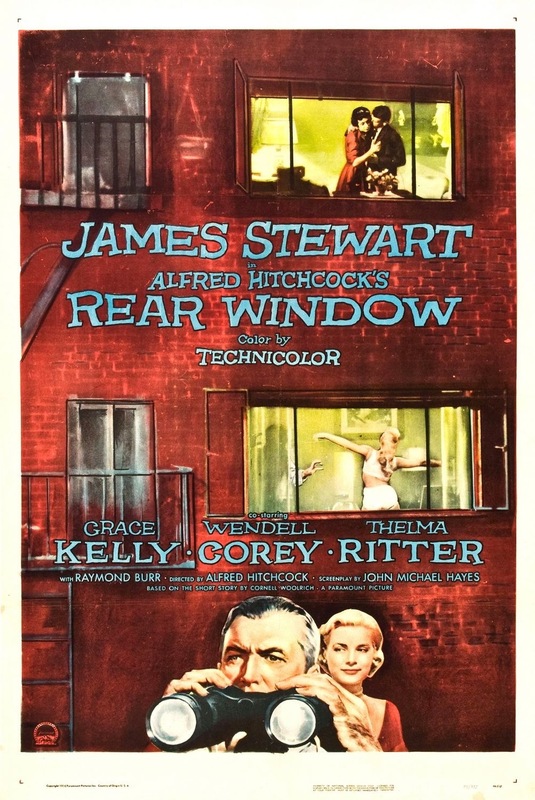 Rear Window doesn’t rely on cheap gimmicks, but rather a genuine suspense filled film and Rear Window has been copied with such films as Blow Out, which puts an original twist on the concept and Disturbia, which is more or less a remake. Even TV shows such as Matlock has used this film for a source of inspiration. It’s been copied and spoofed, but never topped. L.B. Jeffries (Stewart) is a photographer who broke his leg while on the job and he’s now stuck home in a wheelchair. He spends his time looking out his window watching his neighbors and becomes convinced the man across from him has murdered his wife and he sets out to prove it. 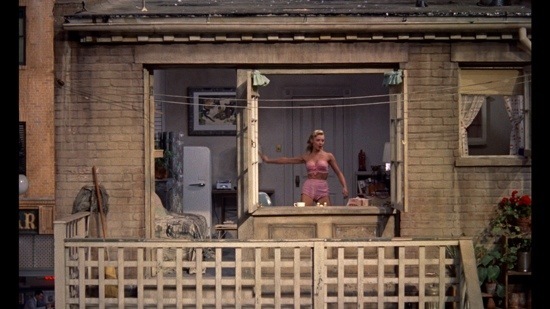 Part of what makes Rear Window so great is in someways we are all guilty of voyeurism to some degree. How many times have you just looked out your window even if not looking at anyone in particular? Watched other people while in a car or bus? Obviously those aren’t extreme, but we all have a little voyeurism inside of of us and to me that’s a big reason Rear Window works so well. The screenplay by John Michael Hayes is simply outstanding; Rear Window is very much driven by its main characters and they are well developed with plenty of depth. The main plot doesn’t really kick in until about the 30-minute mark, but the script is still a success due to the great characters written by Hayes and their interactions greatly drive the film early on and even after the plot gets going the characters are still able to carry the picture. 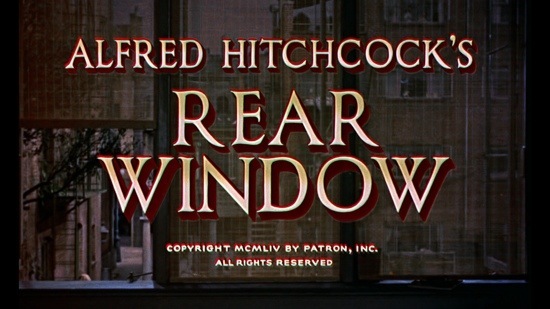 In my opinion Rear Window is a much watch for every writer as its a great way to learn how to write a cleverly plotted screenplay and how to write characters with depth. 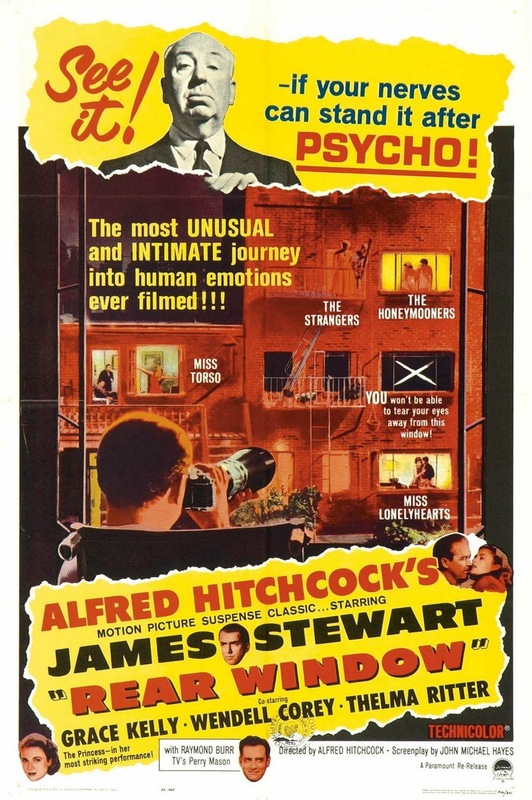 Alfred Hitchcock is one of the most legendary filmmakers of all time and with Rear Window he delivers some of his best scenes of suspense and as I stated I would probably favor Psycho, but its very close and I could easily change my mind. The pacing is outstanding as each scene furthers the film in either story, character or suspense. Rear Window is masterfully directed. The people that L.B. watches are so well developed despite at times having no dialogue or when they do we can’t always hear everything their saying and with these characters, Hitchcock gives them more depth than most filmmakers with major characters. 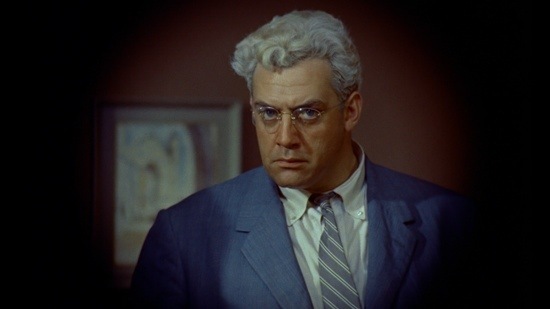 From a suspense side this just might be some of if not the best work of Hitchcock’s career with the highlight being Lisa (Kelly) investigation Thorwald’s (Burr) apartment for evidence as he enters the house and L.B. and his nurse are helpless and can only watch hoping she makes it out. No matter how many times I see this film that scene never fails to get me on the edge of my seat even if I know the outcome. Alfred Hitchcock makes a truly classic film for the ages and you won’t find many films with more suspense and great characters full of depth. 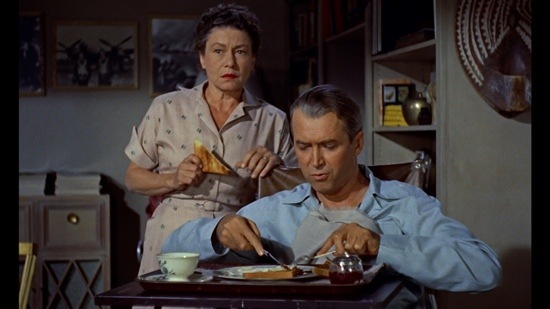 James Stewart is one of my favorite actors; he has a great presence and is perhaps the most likable actor I’ve ever watched and here in Rear Window James Stewart again delivers a brilliant performance. He’s had so many great roles, but this could very well be his best. I’ve only seen 3 films with Grace Kelly with the other two being Dial M for Murder and High Noon. Despite only seeing three of her films she’s one of my favorite actresses. She’s just so memorizing and is the definition of beauty and class. However is Thelma Ritter as Stella that steals the show with a truly hysterical performance. Overall Rear Window is an iconic film that to this day still holds up. 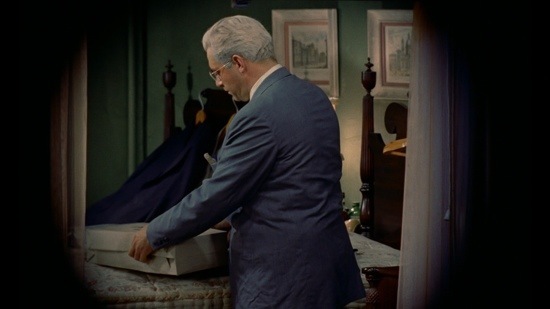 With a great screenplay, a masterful director and great cast makes Rear Window amongst the greatest films ever made. The Blu-ray release comes 58-years after the original theatrical release and the results are mostly positive. I actually never saw Rear Window on DVD as all my viewings of this classic film were on TCM. I don’t think I need to see the DVD to know this would be an upgrade. The video quality is excellent and detailed. There are however moments where the quality slightly drops, but its only a couple of scenes and really only adds up to a couple of seconds. However with that said I can’t help to think a little more work could have provided better results. After seeing what Universal did with their Monster movies they kind of set the bar high for every release to follow. 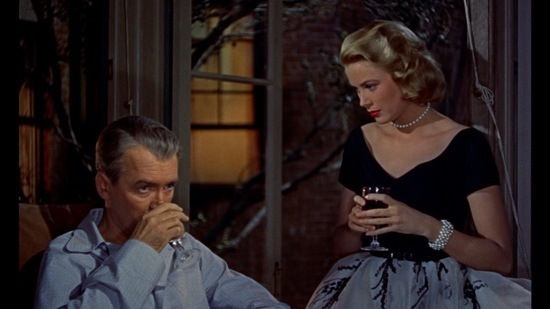 With all that said Rear Window is a revelation in HD, but I still feel Universal could have done a tiny bit more. The audio is top notch and overall this is a great release for a great film.